Branching away from the anthemic rock of Evanescence, lead singer Amy Lee has announced that her forthcoming solo project will be a children's album. Titled Dream Too Much, the record will arrive at the end of next month. 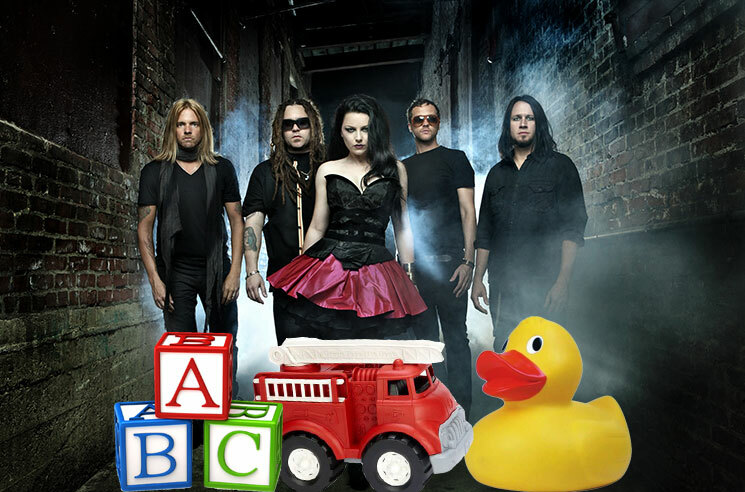 Running 12 tracks in length, Rolling Stone reports that Dream Too Much will see Lee put her own spin on the Beatles' "Hello Goodbye" and Sesame Street staple "Rubber Duckie," along with a number of kid-appropriate originals. The tracklist, which can be found below, reveals that, no, Lee will not be telling youngsters to "Wake Me Up Inside." The album is truly a family affair, with Lee bringing her father, uncle, two sisters and her two-year-old son Jack in for studio sessions. Initially conceived as a studio-time present for her father, it grew into something more. "Dad has always been talking about making some kid songs for Jack to have later in life," Lee told Rolling Stone. "[My husband suggested,] 'You guys should just do it, get in the studio together, you've never been in the studio together, you're both musicians. "I'm always looking for ways that I can expand myself creatively and this was a surprise. This kind of came out of a very random place and a very pure place. It was just for ourselves and it turned into something really beautiful." Dream Too Much will arrive September 30 as an Amazon Music exclusive. Read through the tracklist to hear the title track in the player below.